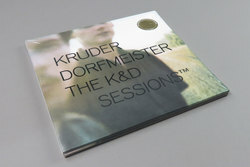 Kruder & Dorfmeister - The K&D Sessions TM. Vinyl LP. Bleep. A true classic, released for the first time ever digitally. Peter Kruder and Richard Dorfmeister dropped this double album back in 1998 and received praise from fans and critics for its breadth and vibrancy. The Vienna-based duo brought through 2 previously unheard original cuts in the form of the brilliantly unnerving Lexicon and the masterfully composed Boogie Woogie. Their carefully selected inclusions from other artists range from the dub spaciousness of Bomb The Bass’ Bug Powder to the drum n bass pulse of Count Basic’s Speechless. Aside from being a golden chapter in !K7’s illustrious output, the compilation is testament to the curatorial and creative genius of Kruder & Dorfmeiste.